Visit www.FluorideFreeHBG.org for more information. Healdsburg is the only city in Sonoma County with artificially fluoridated water. In 1952 fluoridation was on the ballot in both Santa Rosa and in the City of Healdsburg; Santa Rosa rejected fluoridation while Healdsburg approved it. 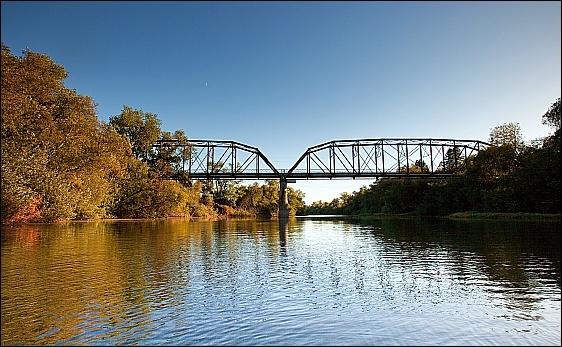 Healdsburg has been fluoridated since 1953, over 60 years. 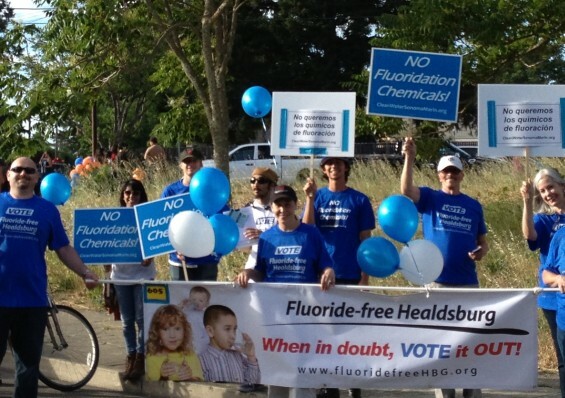 In partnership with Clean Water Sonoma-Marin, Fluoride-Free Healdsburg gathered over 1000 signatures, 867 certified, on a ballot initiative petition to revisit the issue of Healdsburg water fluoridation, more than enough signatures to allow a vote. More than enough to give voters a long-overdue choice about clean, fluoride-free water. THIS YEAR, FOR THE FIRST TIME SINCE 1952 Healdsburg residents had the opportunity to decide for themselves about fluoridation chemicals in City tapwater. Nevertheless, Measure P: Shall the City of Healdsburg continue to fluoridate its water? passed by a 2:1 vote. Healdsburg residents, as well as residents of nearby unincorporated areas, including Fitch Mountain, will continue to receive fluoridated tapwater. According to The Press Democrat, the California Dental Association spent more than $45,000 to convince Healdsburg voters to continue fluoridation, an amount far outstripping the less than $3,000 raised by water fluoridation opponents. 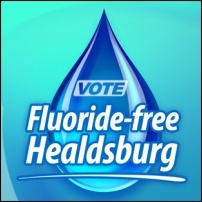 Ballot Measure P offered Healdsburg voters the opportunity to stop water fluoridation for the first time in over 60 years. 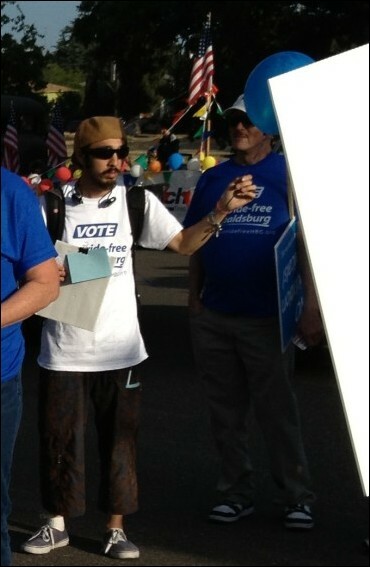 Members of Fluoride-Free Healdsburg hit the streets to get out the vote from morning to evening today. After the polls closed, No on Measure P supporters gathered at the Healdsburg Bar & Grill, along with Yes on Measure P supporters, and the James Gore for Supervisor team and supporters, to watch the votes come in. The League of Women Voters Healdsburg City Council Candidate Forum (9/30/2014 at The Healdsburg School) included a discussion of local Ballot Measure P.
Measure P, qualified for the ballot through a citizen initiative, will allow Healdsburg voters to decide whether to end more than 60 years of water fluoridation. Clean Water Sonoma-Marin Director Dawna Gallagher-Stroeh drew the short straw and spoke first. 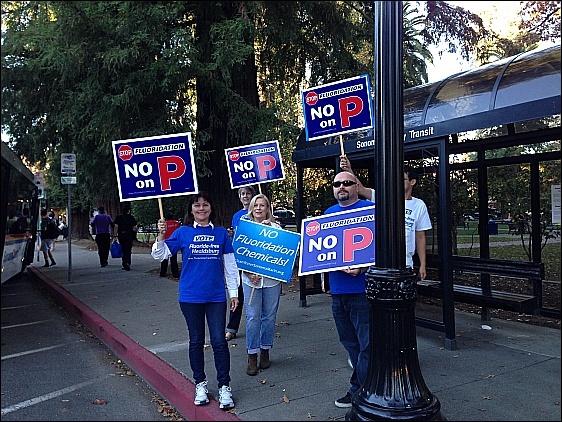 Gallagher-Stroeh presented the “No on Measure P” position, the reasons to stop fluoridating Healdsburg water. National ADA fluoridation spokesman, UCSF professor Howard Pollick, and local fluoridation proponent, dentist Sean Widdick together presented the “Yes on Measure P” profluoridation position, after which a League of Women Voters representative read questions for the panel submitted by members of the public. The evening was sponsored by the League of Women Voters, The Healdsburg School, the Healdsburg Tribune, and the Healdsburg Chamber of Commerce. For more information, visit www.FluorideFreeHBG.org. This November, Ballot Measure P will allow Healdsburg voters to decide whether or not to stop fluoridating their city’s tapwater. Most residents would like to know more about the issue before voting. 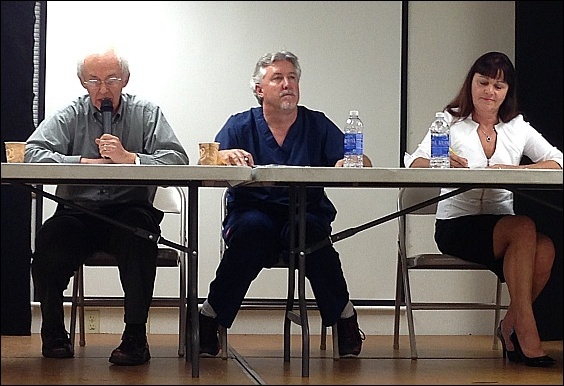 On September 20, 2014, Fluoride-Free Healdsburg sponsored a Community Health Forum at the Healdsburg Regional Library. It was a rare opportunity for the public to ask questions about water fluoridation and get answers in an open discussion. A brief presentation was followed by a free flowing discussion with the three panelists, Santa Rosa dentist Dr. Laura Gaeta Wilson, Board Certified family practice physician Dr. April Hurley, and special guest Dr. Bill Osmunson, DDS, MPH, Founding Director of the Institute of Comprehensive Dental Studies for Aesthetic Dentistry, Neuromuscular and Craniofacial Pain. Dr. Osmunson has an intimate understanding of both sides of the water fluoridation issue because he himself actively promoted fluoridation from 1978 until around 2000, giving talks, and supporting fluoridation in panel discussions. He says, “One of my patients urged me to read the scientific studies for myself. It took me perhaps 5 years of intense study before I had the courage and confidence to speak up in public against fluoridation of public water. Dr. Osmunson says, it is “not uncommon to have patients receive gorgeous porcelain veneers to, in part, correct their dental fluorosis (white and brown damage from too much ingested fluoride). “With over 40% of children in the United States having visible dental fluorosis, the true costs for cosmetic damage to teeth alone is substantial. Certainly, for financial reasons, most will not seek treatment, but the public liability for damage is significant. Dr. Osmunson says, “the numerous human studies suggesting neurological damage, including several IQ points drop, are of most concern. The brain is a terrible thing to waste. The question is not whether fluoridation reduces IQ, but at what age and how much. The Healdsburg Fluoride-Free Movie Night crowd at Villa Chanticleer happily munched hot popcorn and other fluoride-free refreshments while watching a free screening of “The Case Against Fluoridation” by international water fluoridation authority, toxicologist Dr. Paul Connett. 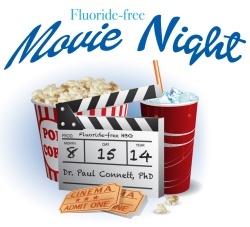 There was a spirited discussion after the movie, with fluoridation questions answered by former fluoridation supporters, Dr. Bill Osmunson, DDS, MPH, and Dr. Laura Gaeta Wilson, DDS. The evening was sponsored by Fluoride-Free Healdsburg. Visit www.FluorideFreeHBG.org for more information. Healdsburg Mayor Jim Wood is a dentist who believes in the effectiveness of fluoridated water in combating tooth decay…Monday night [Wood] convinced his fellow council members to have a group of health professionals…write a defense of fluoride for voters to consider. “They have more expertise than I on this issue,” he said of Save Our Smiles, a loose group of professionals he said has worked on fluoridation issues in Sonoma County. With the Fluoride-Free Healdsburg measure heading for a vote in November, Healdsburg residents are discussing water fluoridation with new interest, asking questions, and looking for answers. 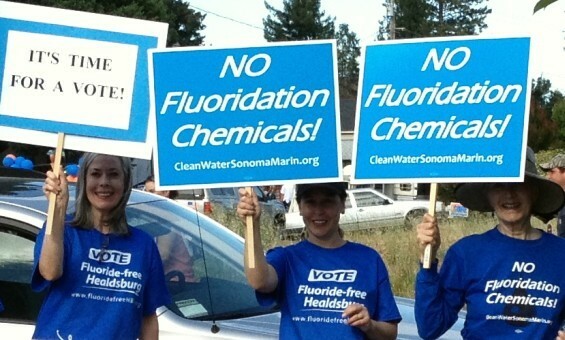 The 1952 campaign to fluoridate Sonoma County communities was part of the national effort. That year Santa Rosa and other cities voted to reject water fluoridation. With around 600 votes in favor, Healdsburg was the only city in the County to approve water fluoridation, which continues to the present. 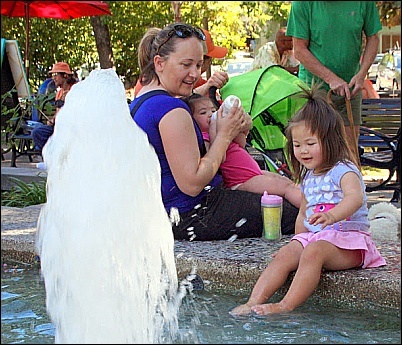 In June, 118 Healdsburg residents signed a letter to the City Council requesting a warning in municipal water bills, alerting customers to the risk of dental fluorosis (mottled teeth) when babies drink formula mixed with fluoridated water. Dental fluorosis is a visible sign of systemic fluoride poisoning, and according to the Centers for Disease Control affects some 41% of U.S youths ages 12-15. In July, 50 residents wrote to ask that the Council provide studies showing that drinking water treated with sodium fluoride does not cause health problems and is effective in reducing tooth decay, and asked that the studies be available to the public before the proposed Town Hall Forum on Fluoridation. 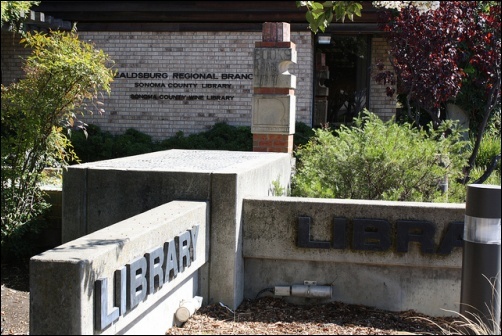 At the same time, the Healdsburg City Council was invited to be the official sponsor of the Town Hall Forum, which would be held at Healdsburg City Hall in September . Not a debate, the Forum would be an opportunity for residents to hear both sides of the issue, and to ask questions and get answers from experts representing both positions. * NOTE: For example, World Health Organization tooth decay statistics (1970-2010), the NIDR study (1986-1987), NRC Report (2006), and studies by Bassin (Harvard School of Dental Medicine 2001), Choi, et al (National Center for Biotechnology Information, U.S. National Library of Medicine 2012), and Grandjean (The Lancet 2014). Links or PDFs are available by request at CleanWaterSonomaMarin.org and FluorideAlert.org provides the most complete archive of fluoridation research. The Northern California City of Healdsburg is the only city in Sonoma County to fluoridate its public water supply. Until recently, many Healdsburg residents were unaware that their tap water has been fluoridated for over 60 years. 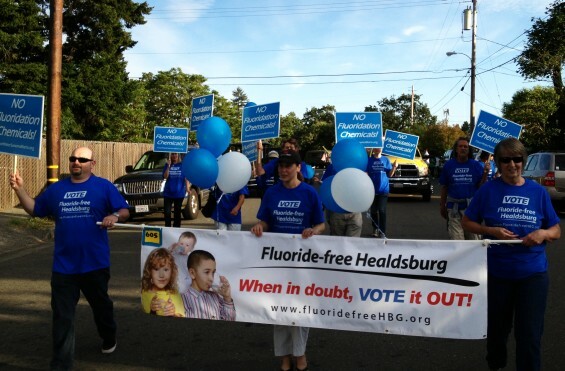 As a result of growing concern, residents formed the grassroots organization Fluoride-Free Healdsburg and, working with Clean Water Sonoma-Marin, began the ballot initiative process to allow a long-overdue vote to end fluoridation. Of the over 1000 residents who signed the petition to qualify the initiative for the ballot, the Sonoma County Registrar of Voters has certified 867 signatures, more than enough to allow Healdsburg voters, for the first time since 1952, the opportunity to choose clean, fluoride-free water. 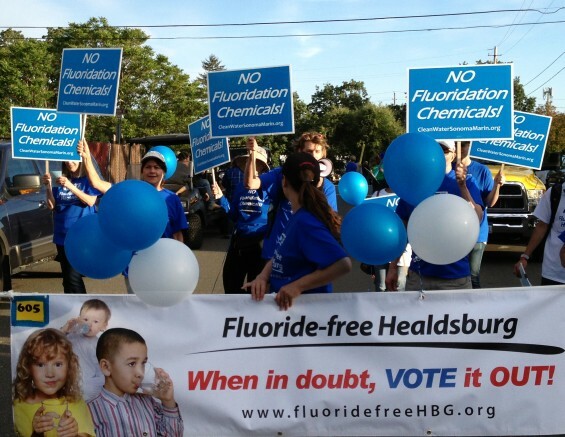 On Monday June 2, 2014, the Healdsburg City Clerk presented the Fluoride-Free Healdsburg ballot initiative petition to the City Council, which announced that the measure will be on the November 2014 ballot. The warning is similar to warnings already adopted by the cities of San Francisco and Sunnyvale, and the State of New Hampshire. Yesterday all Healdsburg turned out to celebrate at the 65th Healdsburg Future Farmers Country Fair Twilight Parade. “Thousands of people lined the 10-block route Thursday evening for the annual parade, which kicks off the Memorial Day weekend and the Healdsburg Future Farmers Country Fair…the parade’s lineup included military trucks, classic cars, homemade floats, bicycles, bands, dancing horses, dogs, clowns and even a rabbit.” – Elizabeth Cosin, “Healdsburg Twilight Parade Kicks off Ag Fest.” The Press Democrat (5/22/2014). 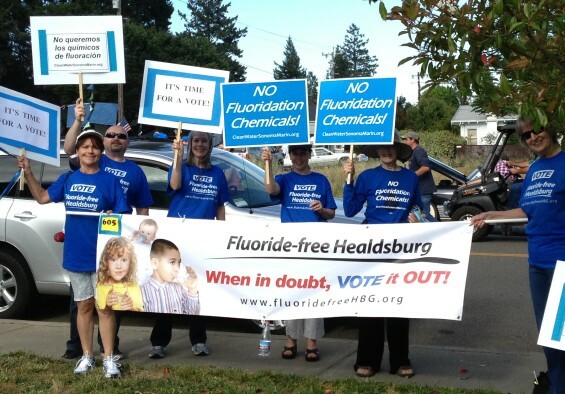 FLUORIDE-FREE HEALDSBURG WAS THERE TOO, marching in support of a new ballot measure that gives Healdsburg residents the opportunity to vote for fluoride-free water for the first time in over 60 years. Members and supporters carried signs, balloons, and an 8-foot long banner created by Healdsburg web designer Brian Pardini . Today a group of concerned Healdsburg citizens requested Clean Water Sonoma-Marin’s assistance with a ballot initiative, an amendment to the Healdsburg Municipal Code, to halt the addition of fluoridation chemicals to Healdsburg Municipal water. Healdsburg, a small city with a population of around 8000, set in the heart of Northern California’s world famous wine country, has fluoridated its municipal water for over 60 years.